Cox dry heat sterilizer. The world's fastest. What does this mean to you? ... less instruments to buy. 1. You can now insert a thumb drive when you run a cycle, or leave it for the whole day, to download the data onto your computer. The data that you will be able to print are: The warm up time, the date, time, & temperature of each cycle. It will even tell you the temperature it ran for each minute. This is a great benefit, cause you may run a spore test, record the data, and if the spore test result will come back negative, you may assume that every cycle that day, or week would also be negative. Great benefit. This could have never been done with the old original Cox you might own now. 2. Because of the new tray handle, the weight of the tray is 3.5# less than the original Cox. You no longer have to remove the entire draw assembly. Only the tray with the instruments. 3. Locking of the door mechanism: The old Cox had the tray assemble sticking out causing often for staff to bump into the sterilizer, and also at times, for the draw to come out, thus interrupting the cycle of the sterilizer mid stream. Now, it doesn't stick out, and it is 100% safe and locked. No more heat loss. 4. Opening of the chamber is higher: thus leaving more room to insert and remove the tray. No more instruments sticking when trying to pull out the draw assembly. 5. The housing of the new sterilizer was changed to make it a flat surface on top for more options placing in an office setting, with the controls on the front for better access. The finish on the new housing is easier to keep clean than the stainless old one. 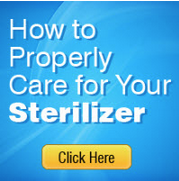 Looking for a better way to sterilize your instruments? 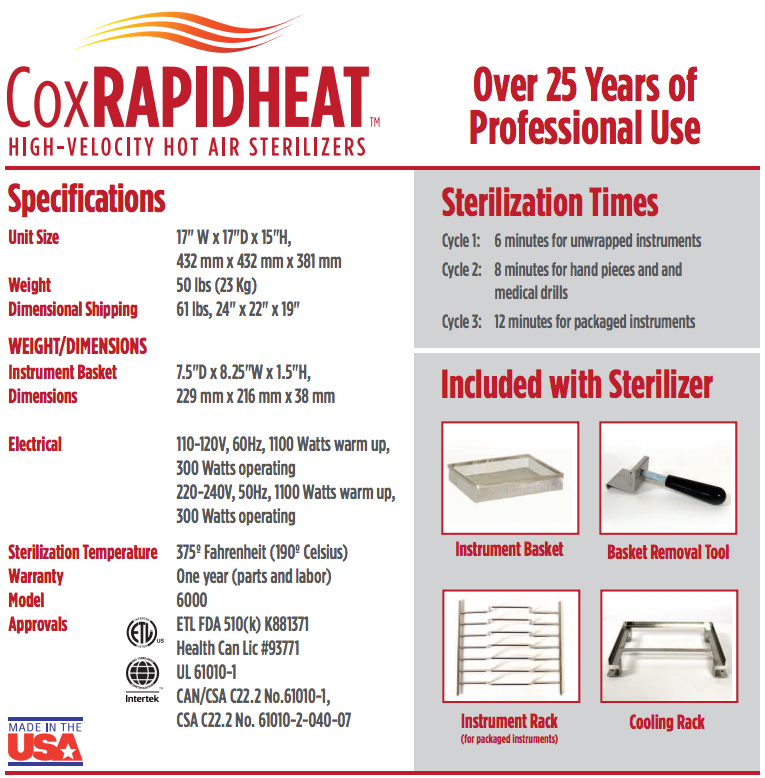 Try the COX Rapid Heat Transfer Sterilizer. since the COX unit utilizes dry heat rather than steam heat, it won't corrode or dull your instruments or cause them to rust, thus extending the life of every valuable instrument you've purchased. there is no need to purchase supplies such as distilled water, rust inhibitors, or chemical solutions. because of the COX sterilizer's superior speed, it gets your instruments back to you quicker -- which will mean avoiding the cost of buying extra sets of instruments. Biological tests were conducted on the Cox Rapid Heat Transfer Sterilizer by the Microbiology Department at the Baylor College of Dentistry in Dallas, Texas. The spore forms used and successfully killed were Bacillus subtilis and Clostridium sporogenes, which have been selected by the American Organization of Analytical Chemists (AOAC) and the FDA (Food & Drug Adminstration) as the dry heat-resistant microbes to be used to establish verifiable sterilization. Established test protocols were strictly adhered to. Additionally, the Cox Sterilizer has been authorized for commercial distribution in the U.S., has been recognized by the ADA (American Dental Association), and has been tested and listed by UL (Underwriters Laboratories), and the Canadian Standards Association (CSA). It's fast, easy, and it saves you money. A. 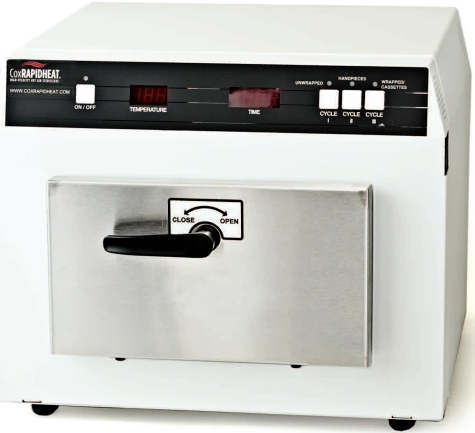 The COX Rapid Heat Transfer Sterilizer is a fast, simple solution to your sterilization needs. B. Because it utilizes heated air that moves at a rate of 2,500 feet/minute, it is able to sterilize objects in as little as six (6) minutes -- faster and easier than any other sterilizer available. C. No longer will you and your staff be bothered with all the problems inherent with other forms of sterilizations. Since the dry heat system won't corrode or rust your instruments, you won't have to replace them so often -- thus saving you money. D. Its amazing speed means you won't have to buy duplicate sets of instruments -- again, saving you money. There are no supplies to buy. In addition, since it's so easy to use, it frees up your staff members for more productive work -- so you can handle more patients than ever before. E. the COX sterilizer is very simple and easy to use, and there are very few things that can go wrong during the sterilization process.